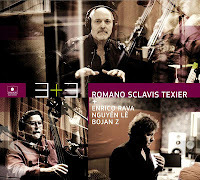 For those of you who know the fantastic French trio of Aldo Romano on drums, Louis Sclavis on clarinet and Henri Texier on bass with their "Carnets De Route" and "African Flashback" trio albums, this review comes as a warning. The trio invited three other musicians, Enrico Rava on trumpet, Nguyên Lê on electric guitar and Bojan Z on piano, all three musicians who have played with the other three in previous bands and performances. The end result is almost the opposite of the trio albums, which were lyrical and refined, but above all had a kind of straight-to-the-heart authenticity, with solid and beautiful improvisations over Africa-inspired melodies and rhythms. This album also has the great themes and compositions, yet the additional elements, and especially the electric guitar, give the music a more fusion-like feel, leading to a too polished and commercial touch. The trio pieces ("Nous Trois", "Rituel à Trois", "Valse à L'Âme", "Moins Qu'une Ombre") are without a doubt the best tracks on the album, and they come close to the music we're familiar with, and when only Rava joins on "Ravages", the end result is also excellent. But that's only half the album, and that's a little sad. And this is not to denigrate the musical skills of Nguyên Lê and Bojan Z, who are both excellent, it's just that their addition makes the music stylistically more slick and less adventurous and authentic. But if you get a chance to see the trio in a live setting, don't hesitate. And try to get hold of their previous albums. Merci de mettre ainsi en avant ce formidable album propulsé par ce trio frenchy très novateur, en tous domaines. Un album que j'affectionne particulièrement. Formidable blog que je lis souvent, même si mon anglais ne me permet pas de commenter fréquemment. Merci de défendre ainsi le free qui a de nombreux adeptes. Pas de problème, on parle français ici (aussi). once, and went right out and bought the two albums you mentioned. They're both a treat to listen to, and I return to them frequently. Brilliant review on music, Jazz is popular and relaxing music. Keep posting.